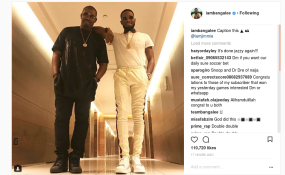 After their reconciliation on Wednesday night, Don Jazzy and Dbanj have further thrilled their excited fans with pictures of themselves striking a rare pose since their messy split four years ago. Nigerians on social media seem unable to get enough of both music heavyweights and have been urging them to come together and record one last track together. Don Jazzy and Dbanj have shared the picture on their Instagram handles and it has literally led to an Instagram meltdown in Nigeria. The photograph has been shared over 230,000 times alone since it was posted at 2p.m. on Thursday. The pair performed lastnight alongside their ex-Mo'Hits band mates Wande Coal, Dr Sid, D'Prince and Ikechukwu in what has been described as the highpoint of Davido's 30 Billion Concert. Mo'hits was one of Nigeria's most favourite boy bands and their painful split in 2012 shattered the hearts of many. It was therefore a remarkable surprise to have them perform once more. The group mounted the stage at 3a.m. and blessed guests with back-to-back renditions of their evergreen hits and it was a delightful dose of nostalgia. Led by Don Jazzy, Dbanj, Dr Sid, Kay Switch, Ikechukwu, Wande Coal and D Prince gave a brilliant performance reminiscent of the good old days. Their outing has been described as the 'saving grace' at Davido's concert. Meanwhile, Davido declared Wizkid his new best friend at the occasion. Davido speaking at his '30 Billion Concert', the singer told thousands of fans in attendance 'would you like to meet my new best friend?" to which everyone heartily yelled. Wizkid soon emerged from backstage and the two embraced. Wizkid went on to perform one of his recent street jams 'Manya' alongside Davido sending the crowd crazy. WizKid soon gave Davido a hearty shout out before exiting the stage. It is clear that the occasion would mark the beginning of a long-lasting bromance between both stars. Other notable artists who contributed to the excitement of the night include South African rapper Nasty C, Mo' Hits stars -, CDQ, 2baba, Terry G, Humble Smith, Dremo, Mayorkun, Dice Ailes and Reekado Banks.